This is the first version, it was initially operated by Lufthansa and Air France in March of 1993. It is equipped by 4 CFMI CFM56-5C engines, like to the -200. Its 2 closest rivals are the Boeing 777-200ER and, previously, the McDonnell-Douglas MD-11, which is no longer in assembly. One of the heavyweight version of this aircraft is the A340-313X which was first delivered to Singapore Airlines in April of 1996, however Singapore Airlines no longer operates this model. 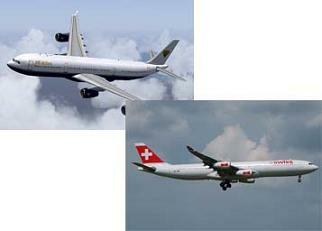 The A340-313E is the newest variant of this type and was first given to Swiss International Air Lines in 2003. A340-200 - Wing span 60.30m (197ft 0in), length 59.39m (194ft 10in), height 16.74m (54ft 11in). Wing area 363.1m2 (3908.4sq ft). A340-300 - Same except for length 63.70m (209ft 0in). 34,000 lbf (151 kN) thrust CFMI CFM56-5C4s.